Recently my sister-in-law, two nieces and new GRAND niece visited us from Texas. There is no one better to tie a family together than a new baby. Eliza is the sweetest, prettiest little bundle of joy I’ve ever held. Recently my sister-in-law, two nieces and new GRAND niece visited us from Texas. There is no one better to tie a family together than a new baby. Eliza is the sweetest, prettiest little bundle of joy I’ve ever held. That’s saying a lot for me since I’m a dog person and puppies have always been the perfect babies in my world. It is a wonderful experience to watch an emerging personality view the world for the first time. 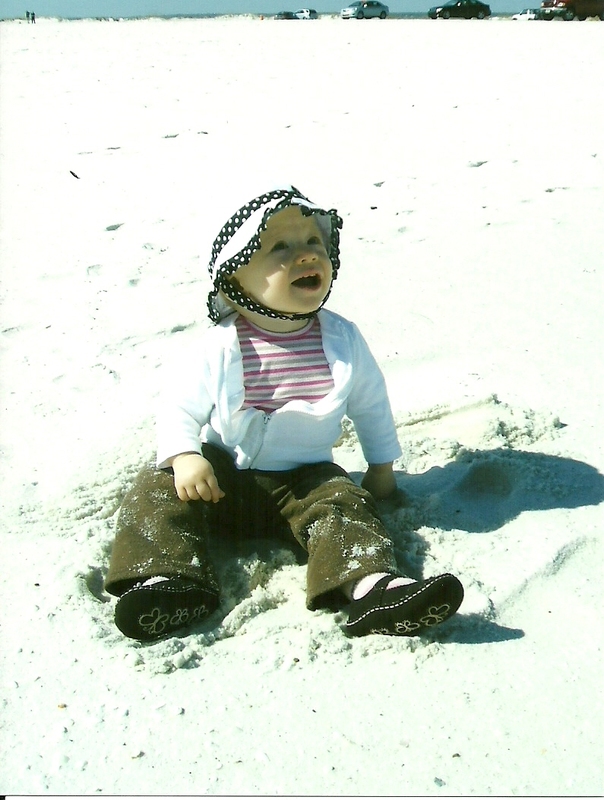 Eliza had her first day at the beach at the Gulf Islands National Seashore, a preserved untouched length of land between Navarre Beach and Pensacola. It didn’t take long for Eliza to cover her clothes with sand. Still energized, she sat with us for lunch at a restaurant at Pensacola Beach, becoming mesmerized by a little girl in the next booth. I suspect Eliza is going to be a high energy, make it happen type of person, always on the go and looking for new experiences. She didn’t fuss, shy away or cry during her entire visit, usually waving at new people and ready to take on a twelve hour day. Mom Jess made sure though that Eliza at least made attempts at several naps during the day. This may have been a last chance for everyone to see my mom before her continuing slide down Alzheimer’s dark tunnel. We were all slightly amused by mom’s comments about her being on vacation and how THIS house looked exactly like her OWN house. What a coincidence. But really it is just too sad to watch someone you love deteriorate mentally and we held onto these remaining moments of half lucidity my mom held in her brain. The slip down dementia’s path has continued since then with several falls, a broken bone and finally entry into a short term care facility. The dogs took a back seat during the family get together. Border Collies, like most dogs, are very sensitive to family changes. They were quiet, remaining outside in the kennel during the visit or inside at night, guarding the house. One night the oldest dog barked annoyingly, not stopping until I got up to check on him. Mom had fallen and he wanted me to know I needed to help her. He remained calm and quiet while the EMT’s came into the house. When anyone comes to visit it is a good time to test new recipes. My niece, Jill, is a vegetarian which was a chance for me to search my file of favorite recipes for something all of us can enjoy. The magazine, Taste of Home, is my favorite for reviewing home tested meals and it came to the rescue with Zucchini Ricotta Bake by Eleanor Hauserman of Huntsville, Alabama. Thanks Eleanor. Another meal was a Quick Shrimp Bisque, Vegetarian Penne, Stuffed Baked Potatoes, with Blueberry Quick Bread, Cinnamon Apple Crumb Pie and One-Bowl Chocolate Cake (dad’s favorite) for dessert. It was a happy, sad, memorable, timely visit with lots of pictures, including a video of Eliza’s first independent steps. If only mom could have fully understood and enjoyed her grandchildren it would have been perfect. This entry was posted in Alzheimer's, border collies, Retirement Life and tagged Alzheimer's, Border Collies, Pensacola Beach, Pensacola Beach Florida. Bookmark the permalink.